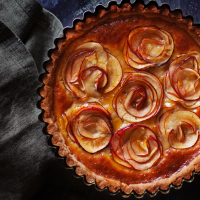 ways to decorate the tart – if you have a mandolin and a little time, the apple flowers create a lovely effect. 1. For the pastry, open the cardamom pod and crush the seeds in a pestle and mortar; discard the pod. Mix into the flours with a good pinch of salt and the icing sugar, then whizz with the butter in a food processor until the consistency of breadcrumbs. Mix the egg yolk with 2 tbsp ice-cold water, add to the processor and whizz until it comes together. Remove, knead briefly and gently until smooth, then shape into a puck, wrap in cling film and chill for 30 minutes. a lightly floured surface, roll out the pastry to 0.3cm thick; use to line a 23cm fluted tart case. Trim the edges and prick the base, then line with baking parchment and fill with baking beans; chill for 30 minutes (or freeze for 15 minutes). 3. Blind bake the tart case for 20 minutes, then remove the parchment and beans and cook for a further 5 minutes. Set aside to cool. 4. For the frangipane, using electric beaters, cream the butter and sugar until pale and fluffy. Beat in the honey, then the eggs, one by one. Beat in the almonds, flour and a pinch of salt until just combined. Spread evenly over the case. 5. To decorate the tart, either slice the apples into 0.5cm wedges, toss in the lemon juice, then arrange in circles, pushing lightly into the frangipane, or use a mandolin to slice the apples thinly, toss in the lemon juice, then twirl and curl to create flower shapes, pushing them into the frangipane as deeply as possible. 6. Reduce the oven to 180˚C, gas mark 4. Bake the tart for 40-45 minutes, until the frangipane is golden. Heat the 1 tbsp honey and apricot jam in a small pan until warm, then brush over the tart. Allow to cool, then serve.